There are two that we consider to be the best when it comes to reducing teeth sensitivity. 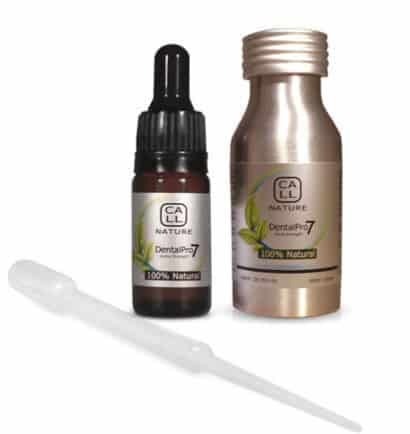 Dental Pro 7 and the Orawellness Healthy Mouth Blend. We have carried out extensive research and have gone and looked at other people's experience's to come to this conclusion. The one thing we should mention is that these toothpastes are oil based which might seem a bit weird at first but believe us, they work wonders. 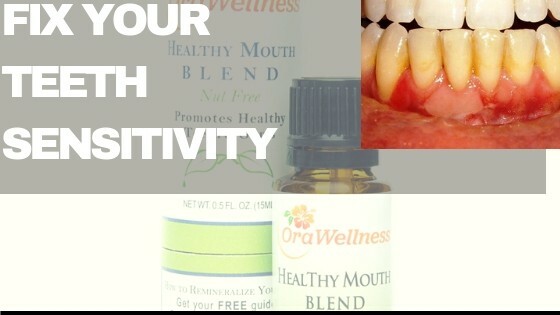 I have personally tried the Healthy mouth blend and noticed my bleeding gums had disappeared during the time I was using it and the sensitivity on my bottom middle tooth had gone down as well. I thought why not do a mini experiment and revert back to the traditional fluoride and other chemically produced toothpaste and do you know what happened? Within weeks my bleeding gums were back and they have become very sensitive to the slightest of touch. There is this 1 tooth on my upper left-hand side which bleeds considerably when I floss it. It goes without saying that I will be going back to oil based toothpastes. If you want to learn more about why we consider oil The Best Natural Toothpaste For Sensitive Teeth please scroll down and be prepared to be amazed! How Does Teeth Sensitivity Start? Sensitivity occurs when there is an underlying problem with specific teeth. The causes can vary from tooth decay, cracks in teeth or incorrect fillings. However, the major cause of sensitivity among the general public is exposed dentin. Dentin is the inner structure of your teeth and once the enamel starts to wear away, any stimuli such as hot or cold will touch dentinal tubules and cause the nerves in your teeth to be stimulated causing that sharp sudden pain. It's really important that you keep the enamel in good shape otherwise you are bound to get sensitivity. True hypersensitivity is largely due to pulpal inflammation and can present the clinical features of irreversible pulpitis, I.e., severe and persistent pain. The pain is usually treated by looking at the patients habits and oral hygiene. Faulty tooth brushing, gingival recession and too much acid intake can be fixed and may stop the condition from occurring or recurring. Females tend to get sensitivity more than males and the age group that is most affected are between 30-40 year old. The most common teeth affected are the canines and premolars. The term natural means there is no use of artificial chemicals, so the first thing you need to look at is the ingredients. If they are naturally sourced then you can start looking for the right type of toothpaste for your condition. 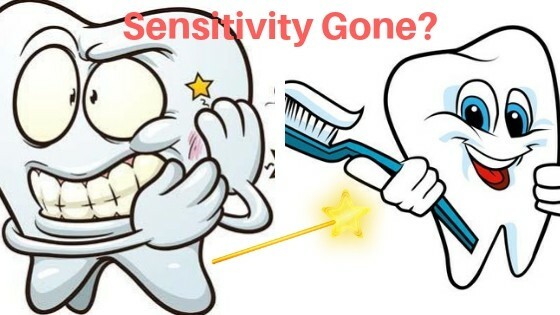 It can be quite daunting at first because there are various different brands out there advertising how they can cure sensitivity in just 30 seconds and all that other BS!. Don't fall for it. What these ingredients will do is help to rebuild the gum tissue around your teeth. This is important because exposed roots can cause sensitivity as there is no enamel on the roots. 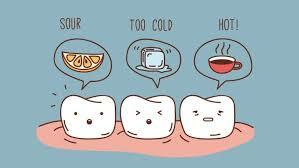 Temperature changes or sweets can affect the nerves inside the tooth. Toothpaste Can Be In Oil Form! If you have not read about Essential oils, you are missing out big time!. They are really important and some scientific studies are even excited at the potential they could have in curing many diseases that we have in today's society. There is proof they have strong antibacterial, anti inflammatory effects along with many other properties. 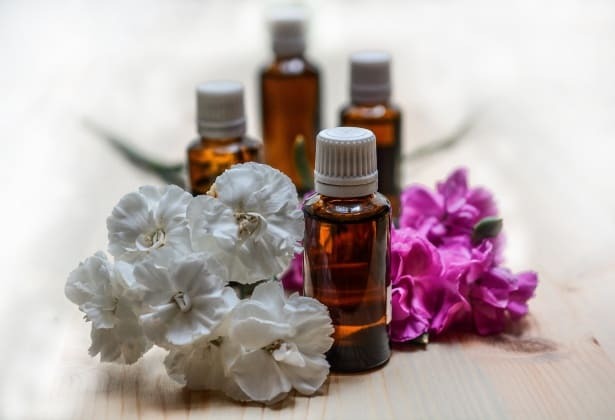 Essential oils are highly potent and do a better job than artificially made chemicals but some people don't know how to use them to brush their teeth. It might seem obvious but oil tends to flow around your teeth and under the gum line whereas regular paste sticks onto teeth. In our opinion, letting the ingredients seep down into and under the gum line's means the oils can work more efficiently and reduce inflammation of gums and also protect the enamel. 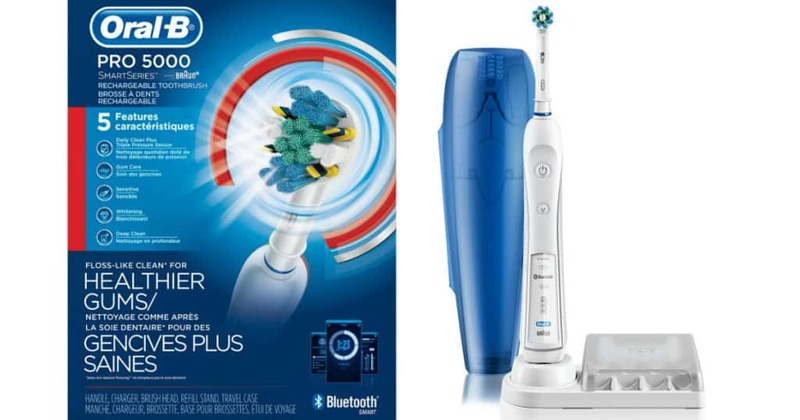 Added 3 drops of the oil blend onto my Bass Toothbrush and brushed my gums directly where they meet with the teeth at 45 degree angles using soft vibrating motions. Once the gums were clean, I got my Electric toothbrush and brushed the surfaces of the teeth. Believe it or not, this simple routine reduced my sensitivity on my bottom tooth and the bleeding drastically reduced. First of all, I have used oil based toothpaste on myself and it worked but that's probably not enough to make you believe this stuff actually works. But there are 1000's of other people online who have seen great benefits to their overall oral health since implementing essential oils into their routine. "I have had sensitive teeth for some time. This winter, with all the snow shovelling, I noticed it really bad as it was hard to breath in the cold air as I shovelled! I would have to keep my mouth closed, the cold air hitting my teeth was like electricity shooting through my head! Well, I remembered Wintergreen talked about on a training call for whitening teeth so I thought, maybe? I ordered it and every morning & night when I brush, I get my toothbrush nice and hot, add 3 drops of Young Living Wintergreen oil and brush my teeth. I have noticed my teeth look 100% better. My sensitivity is completely gone and I've noticed I sleep very sound at night and no bad breath ever (even when I wake up in the morning! ), and I no longer clench my jaw. Even my root-canal hasn't given me any problems since I've incorporated Gaultheria procumbens leaf oil. I'm just so thrilled the sensitivity is GONE, everything else was a huge BONUS! 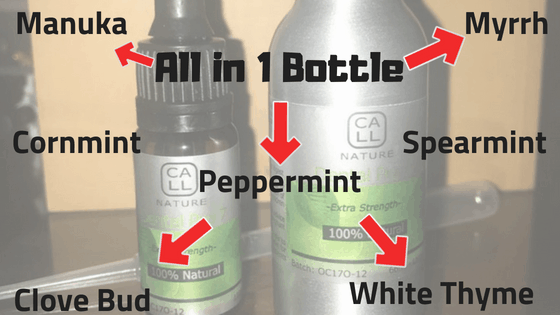 The best part is I noticed the change within 2 weeks of using the oil." Which 2 Are The Most Powerful? This lipid based solution is high strength, nothing has been diluted down and this is the main reason they don't ship to Europe. The countries within this region have strict regulations and the labelling of medical grade and over the counter products makes it difficult. 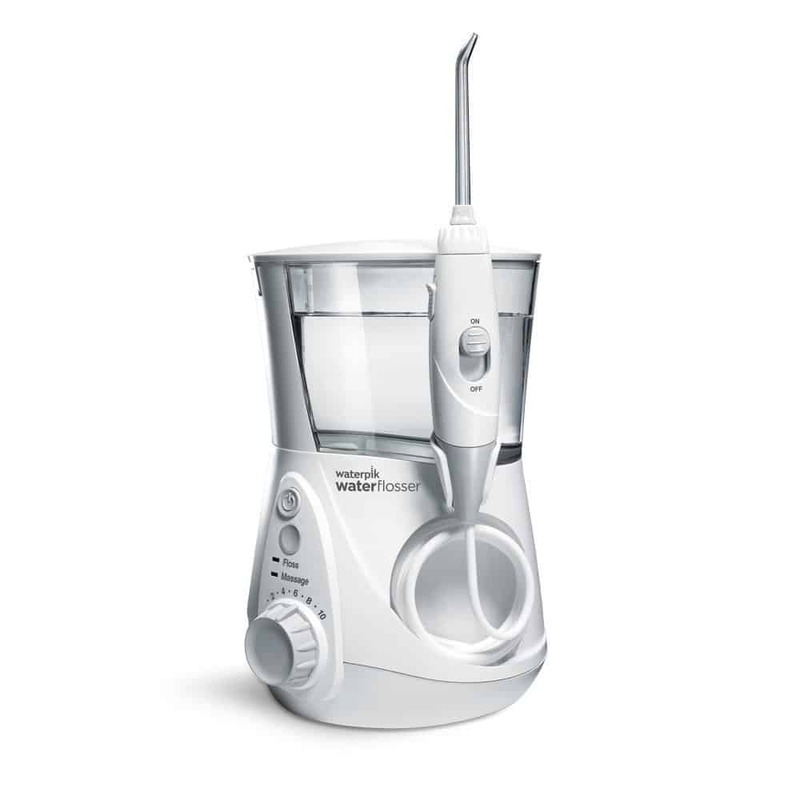 Dental Pro 7 is high strength and would come under the medical grade section which means a lot of testing and trials would need to take place just to get the product into Europe. This isn't feasible for the manufacturer at this moment in time but as they gain popularity, they will start the first phase of European trials. Scientifically Proven - All the essential oils within Dental Pro 7 have been studied and shown to reduce gum and sensitivity issues. Long Lasting - 1 single 64ml bottle will last you up to 6 months. Quick and Easy To Use - Use like you would a normal toothpaste, just apply 2-3 drops to your brush and clean for 2 minutes. 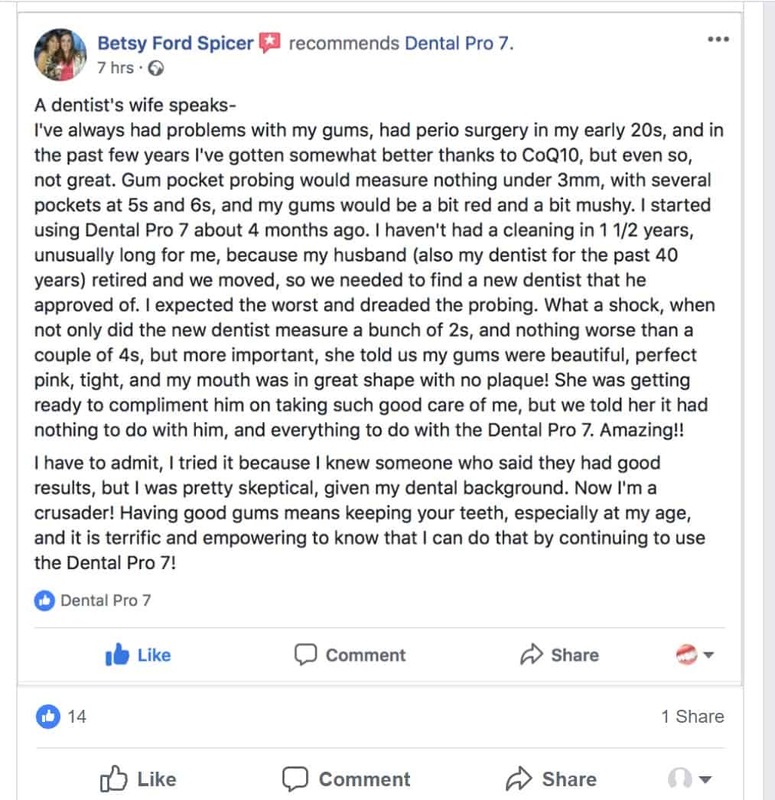 If your interested in learning more about the 11 powerful ingredients and their function in oral health, please read the full review at: Dental Pro 7 Review - It's Scientifically Proven. The key difference between the two is that healthy mouth blend is shipped worldwide and the formula they use is less concentrated. Does less concentrated mean less results? I have used it with great success and so have many others. It uses 6 core essential oils that have been scientifically proven to heal the mouth. 100% Natural - Like the dental pro 7, this mouth blend uses natural plant based botanical oils to give effective results. Multiple Uses - This blend can double up as a mouthwash or apply it to your dental floss to help reach those hard places. 365 Day Money Back Guarantee - The company is confident you will see results so they have no problem giving such a bonkers guarantee! 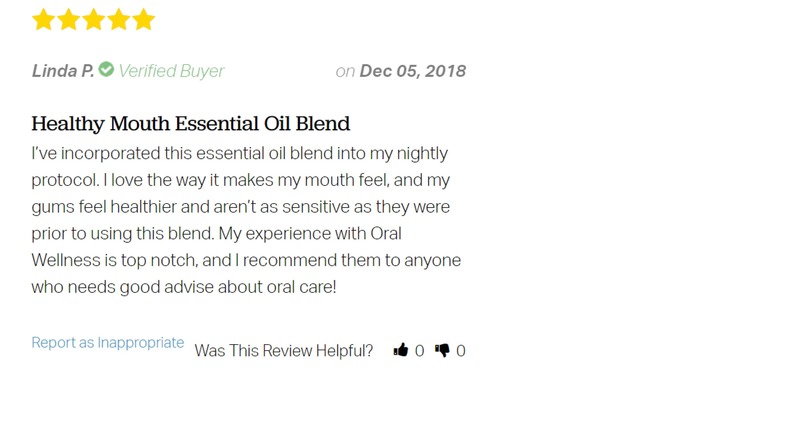 Of course there is a lot more to learn about this blend but don't worry because we have already created a full review post you can read here: Natural Remedy For Sensitive Teeth And Gums - All Organic And No Side Effects!. Which Natural Toothpaste Shall I Go For? There are so many options to choose from but hopefully we have made your life a bit easier by recommending the top 2 currently on the market. 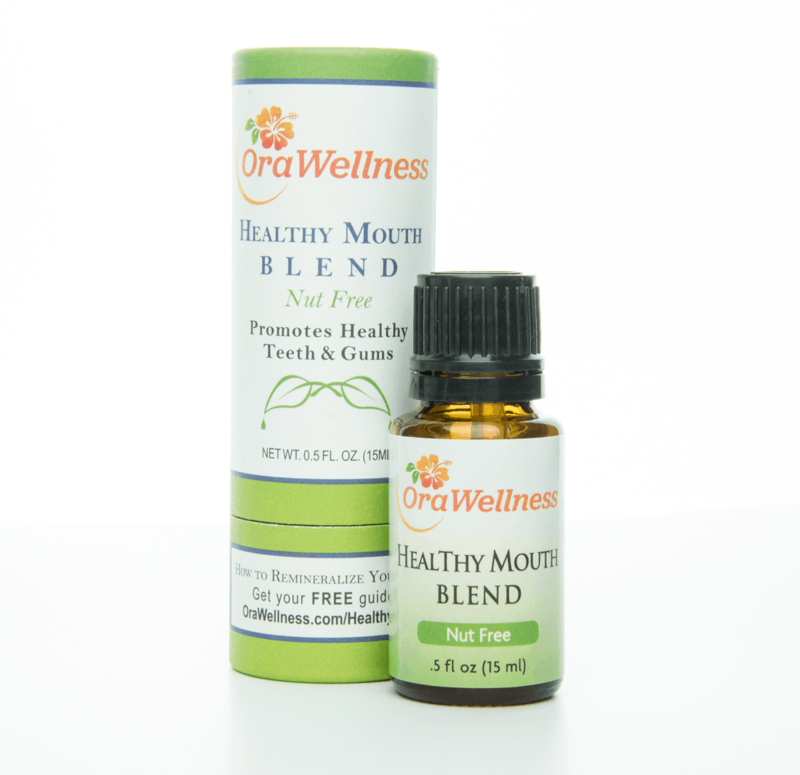 Going by the effectiveness and our own experience, we recommend you try the Orawellness Healthy Mouth Blend because it worked for us. The sole reason I recommend this is because I have brought it and used it myself! 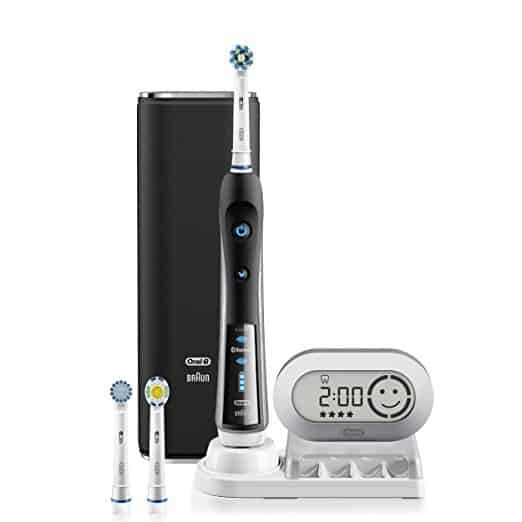 Unfortunately because I live in the European Continent I am unable to try out the dental pro 7 and cannot say from a personal perspective if it worked. But that's not to say it's ineffective, in fact there are tons of reviews on their website and Facebook page that clearly shows it works brilliantly. There are so many natural toothpastes that supposedly target sensitive teeth but most work short term. Your sensitivity will keep coming back. What you need to be focusing on is long term solutions that will help reduce your pain and eventually eradicate it completely. For this you need ingredients that are active and contain bacteria fighting properties. An oil based toothpaste is something you want to be considering because the essential oils contained within them are scientifically proven to help all sorts of oral problems ranging from: bleeding gums, sensitivity, inflammation, tooth decay etc. Regular toothpastes only focus on one issue at a time, that's why you have so many different varieties and brands. It's confusing for everyone. Oil based toothpastes are targeted at your oral health and everything that it encompasses. The two we highly recommend are Dental Pro 7 and the Orawellness Healthy Mouth Blend. We have actually used the Healthy mouth blend ourselves and seen impressive results. The sensitivity on my bottom middle tooth has gone and my gums don't bleed as much as they did. If you have any questions about anything we have talked about in this article please leave a comment below. Great article. I have looked for toothpaste that helped with sensitive teeth. I love to eat lemons and limes. Way too mamy to be honest. Probably three a day and my teeth catch the most damage. Using a good toothpaste helps to prevent the enamel from being eaten away. I also have two teens that wear braces and I am always looking for a good quality toothpaste for them. Thanks for this wonderful and healthy post about the Best Natural Toothpaste For Sensitive Teeth. I never knew about the oil based toothpaste and yes i always have bleeding gums at interval and never knew it might be due to the type of toothpaste i use. I will definitely consider trying the Dental pro 7 toothpaste for a change. Let me just clarify something, Normal toothpaste containing fluoride or other chemicals do not cause bleeding gums. Bleeding gums are due to poor oral hygiene such as not brushing your teeth at all. What we are trying to say is that once you have mild gum disease, these normal chemical filled toothpastes will not cure it. Hi there, thank you for providing a detailed post on this important topic. My teeth aren’t too bad, but there are a couple of things which can be improved with them. I have inflamed gums which means that when I brush my teeth, my gums bleed and I see blood when I spit out my toothpaste. Do these recommended toothpaste’s help with this? If not, do you have any suggestions on what will? Thank you. Yes absolutely. Both of the oil based toothpastes help to treat a variety of different problems from bleeding gums, inflammed gums, sensitive teeth, ulcers etc. I used the Orawellness healthy mouth blend my self and my bleeding went away in a couple of weeks. I combined the bass tooth brushing technique for added benefit.